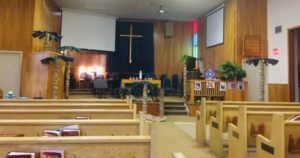 We invite you to join our Grey St Community of Faith Sunday mornings at 10:30 am as we worship and journey towards Easter (Lent). The season of Lent began on Ash Wed (March 6) and continues for 40 days until Easter. 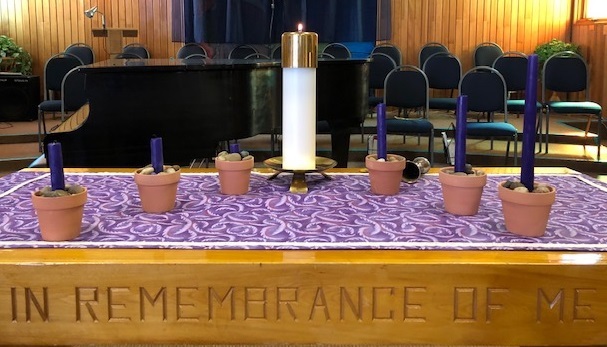 During Lent, our Worship space has been adorned with the Liturgical color purple (representing royalty, repentance, remorse). The three banners represent the time Jesus spent in the wilderness/desert. Each week during Lent, the symbols and our responses from our Lenten Challenge have been added to the banners. Palm Sunday, April 14, marked the end of Lent and the beginning of Holy Week. Watch this space to follow the transformation of our sanctuary as we re-live the Easter story. Candle being extinguished on Good Friday. Watch this space each week for the candles to change.